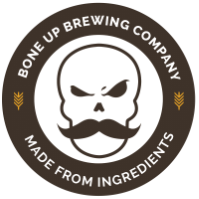 Stats: The Gruncle - Bone Up Brewing Co.
ABV: 7% ish, depending on who's pouring. Color: Somewhere between a pale red and a reddish pale. Food Pairing: Roast pork loin. Best Occasion to Drink: During yoga class. Loudly. Brewers' Notes: One of our first-ever employees is gettin' married soon and we just jumped at the chance to brew some beers for this joyous occasion! With some guidance from the soon-to-be betrothed, we brewed up a quad and a witbier with the intention of blending them at serving to create one tasty-as-heck weddin' beertail! And if you ain't gonna make it to the festivities, never you worry - it'll be pourin' strong in our taproom before, during, and after the big day!